Pull out kitchen faucets with rinsing sprays transform the kitchen sink into a multifunctional work zone. Our kitchen faucet collections fuse perfect ergonomics with award-winning design. With a diverse range of designs and material finishes to choose from, finding a pull-out kitchen faucet to complement your kitchen decor and meet your functional requirements is easy with GROHE. What is the difference between a pull-out spray and a pull-down spray? Both offer the same features and versatility. The difference is in the action required to extract the hand-held spray from the faucet spout. 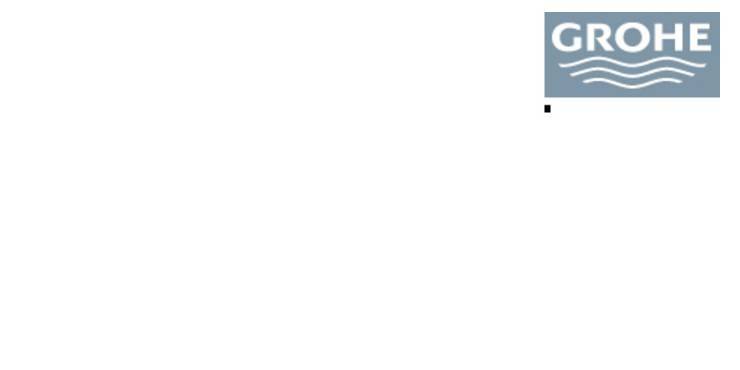 In general, if the kitchen faucet has a straight spout, you need to ‘pull out’ the spray. If the spout points downwards, then you ‘pull down’ to use the spray. For home chefs who are as serious about design as they are about product features, a kitchen faucet with a professional pull-down spray is the latest ‘must-have’ style for designer kitchens. Admired for its semi-professional styling, the GROHE K7 collection is a modular range of kitchen faucets. The eye-catching collection comprises every conceivable combination of faucet and spray: including a faucet with pull-out rinsing spray, professional spray and a side spray. 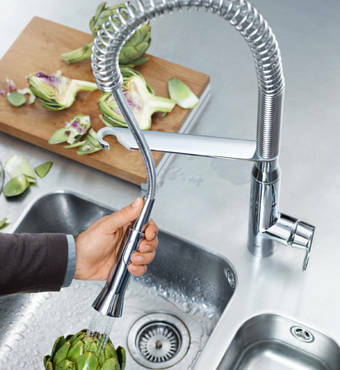 The professional spray and pull-out spray on our K7 kitchen faucets feature GROHE SpeedClean nozzles. Just wipe the surface of the spray to clear any limescale deposits. From rinsing salad leaves and delicate fruit to filling pots and pans, a dual-spray faucet is an indispensable work tool. Our pull-out faucets feature two sprays: a wide, rinsing spray and a regular spray. On kitchen faucets with a large rinsing spray, a rocker switch enables you to alternate between the wide spray and normal stream. On smaller sprays, simply turn the faucet off to revert back to the regular flow. 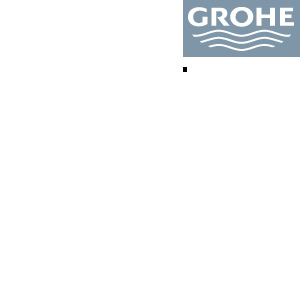 GROHE pull-out sprays have a reach of 15 - 20 in depending on which faucet design you choose. All GROHE pull-out kitchen faucets feature a robust steel hose to ensure pristine appearance no matter how often you use it. A spring below the sink guides the hose back into position after use.